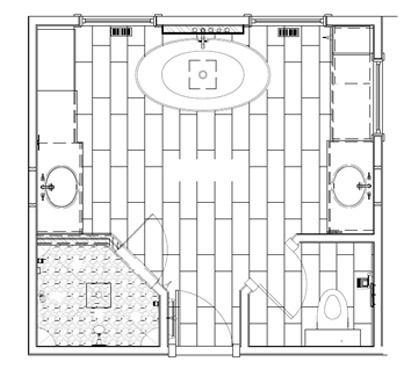 Our starting point was a good sized but underutilized bathroom with an ugly large deck mounted tub and two small vanities. 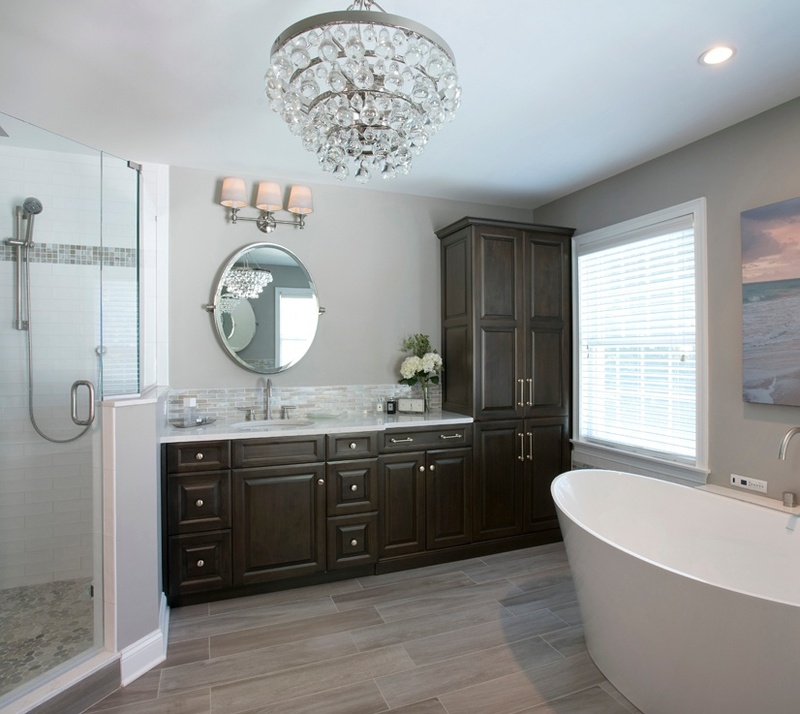 A free standing tub and a beautiful chandelier anchor the new design with his and hers vanities and customized storage for both. 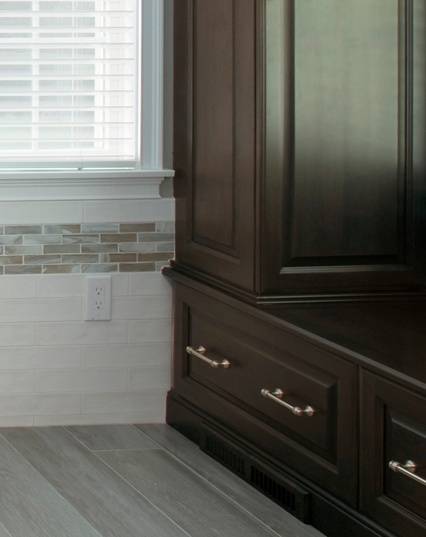 Natural wood is in, and this color scheme accentuates the beauty of wood grain. 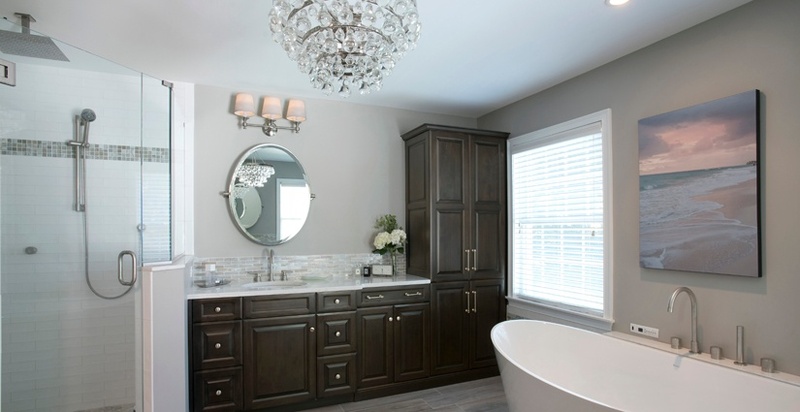 The rich, warm brown tones of the cabinets are balanced with the soft whites and greys of the counter floors and walls. Extra-tall upper cabinets take advantage of unused space and help stop the room from looking oversized. 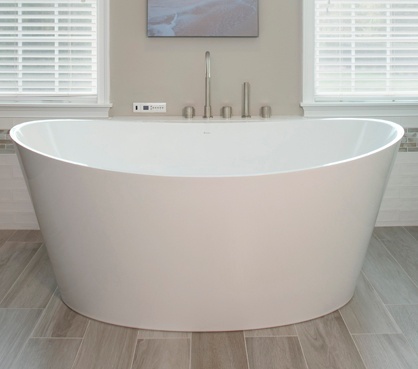 The Bain Ultra heated soaking tub has beautiful lines and thin walls, maximizing interior space. 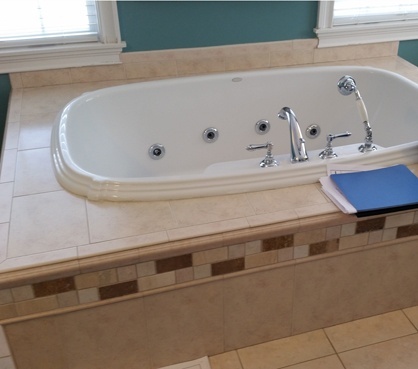 There's enough room for one person to be fully immersed or two to bathe comfortably together. 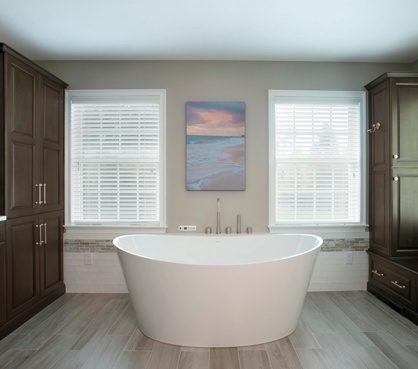 Freestanding tubs look so beautiful, but there is often the problem of where to put things. 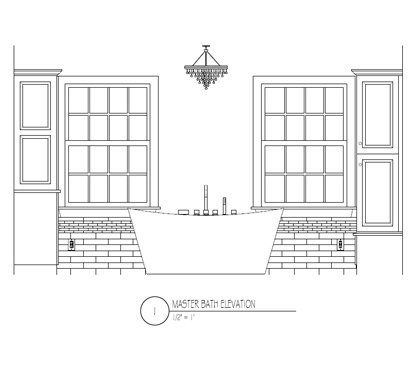 The window seat is the perfect spot to set down your towel while you bathe. A tall cabinet in the corner between the windows anchors the end of the cabinet run. 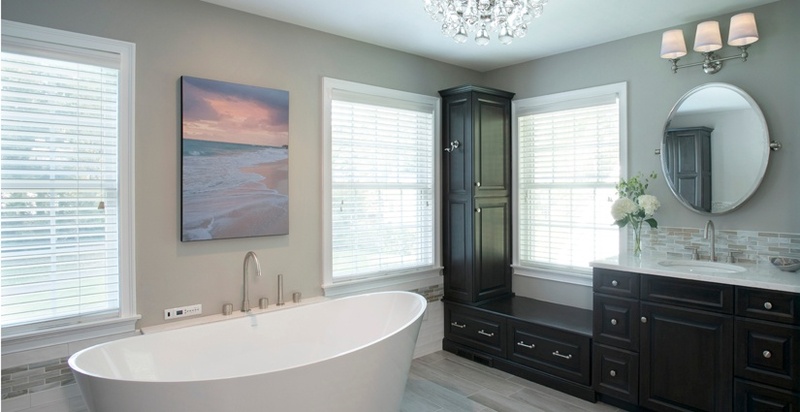 It's a well balanced bathroom that is large enough to tolerate walls of dark vanities, because the espresso is offset by just the right proportion of whites and greys. 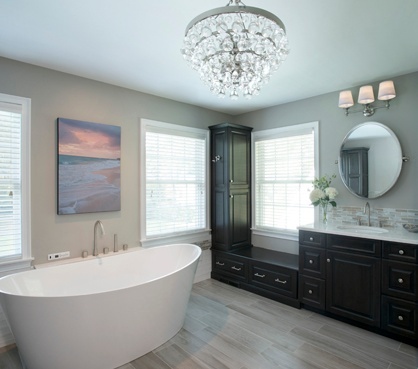 The white tub and shower, and the grey floors and walls work together to provide a serene master bath. 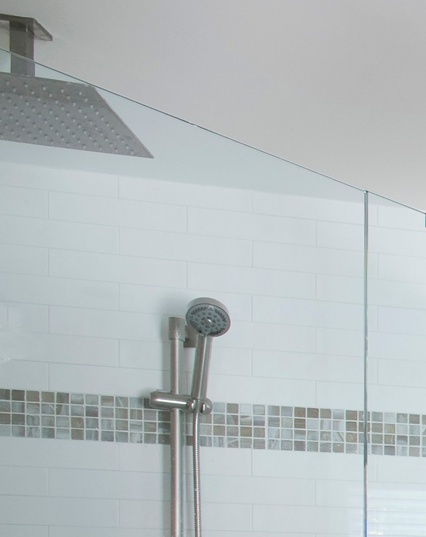 Typically we put deco tile in the shower. 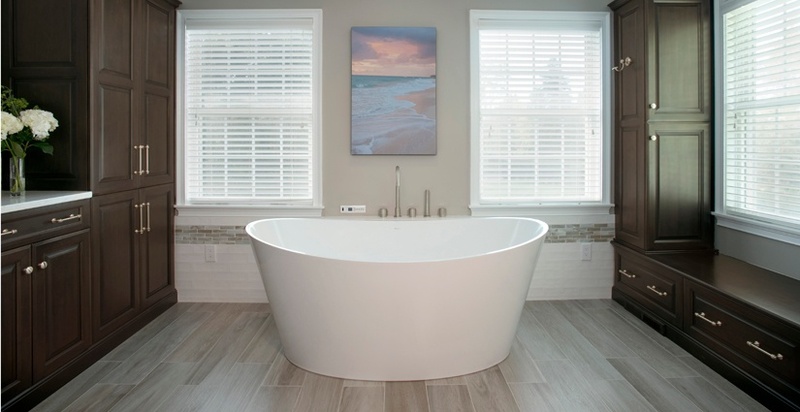 Here, the rules are broken in an elegant wise and peaceful way, as the tile wraps behind the tub, with a soothing greige Lunda Bay glass mosaic tile that compliments the deco tile in the shower. Same glass tile , but a different shape. 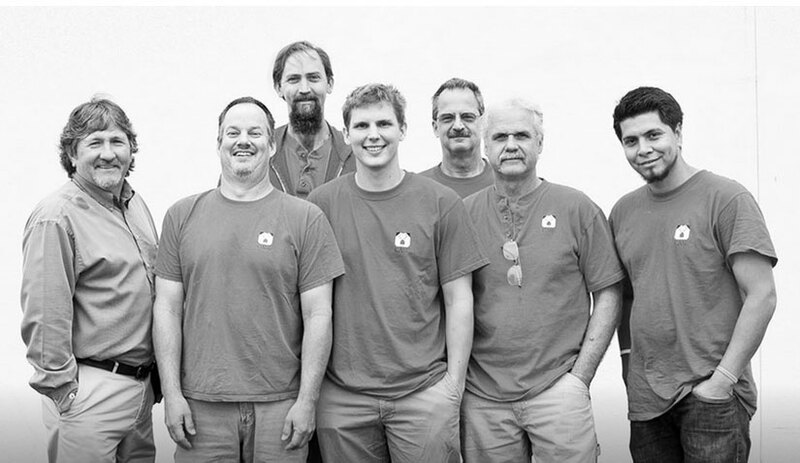 "We have now completed 3 projects over the past 5 years with Clark Construction, and I have only wonderful things to say about them. 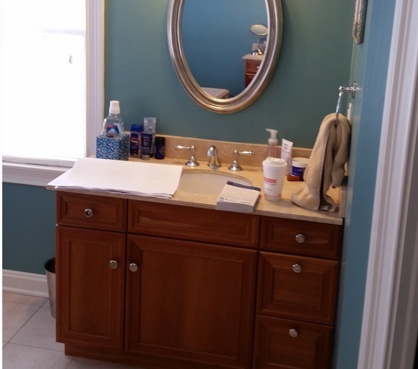 Each project went extremely smoothly, from the design process to the beautiful finished products (master bath, outdoor painting and rotten trim replacement and kitchen.) Everyone at Clark is helpful, considerate and talented at what they do, and all of their subs are professional, neat and wonderfully talented. I can't recommend them highly enough!"